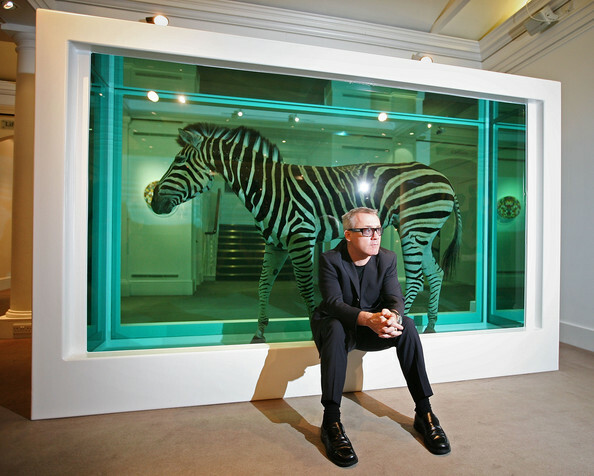 For around 20 years Damien Hirst has been pushing the boundaries of sense, and sensibility, as well as aesthetics, art and earnings to become the highest paid living artist. It would be very hard to argue against the notion that Hirst is not only the greatest and most outrageous publicity focussed artist since Salvador Dali but also that he has forever changed, whether for better or worse, the art world. His first step in doing so was to construct the sensational, and sensationalist “The Physical Impossibility of Death in the Mind of Someone Living” – a shark immersed in a tank of formaldehyde – a theme he extrapolated with other animals alongside an obsession with cigarette butts, putrescence and decay. Hirst’s most recent artwork, a diamond encrusted skull has not sold – it is estimated to be valued at around £50 million. His series of coloured dots, which has enraged art Critic Brian Sewell, is one of thethe most successful (financially) of all time. Hirst has also turned his hand to the decoration of musical instruments collaborating with Flea from the RHCP and also contributed a unique and ultra-rare SPOT styled Fender Telecaster. 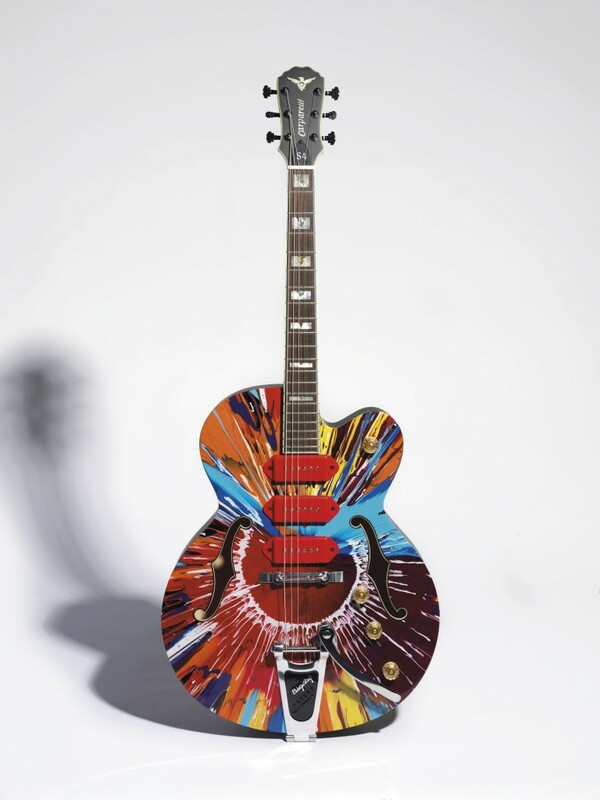 This amazing guitar was offered at Christie’s Post-War & Contemporary Art sale in London on Sept. 14. 2011 garnering a sale price of £39,650 or $62,251 dollars. Somewhat of a bargain for a genuine Hirst artwork. The unique instrument was used by pop icons Squeeze onstage at the Royal Albert Hall in March 2011 for a cancer benefit and proceeds from the sale of the guitar were given to music-focused cancer charities Love Hope Strength Foundation and Teenage Cancer Trust. 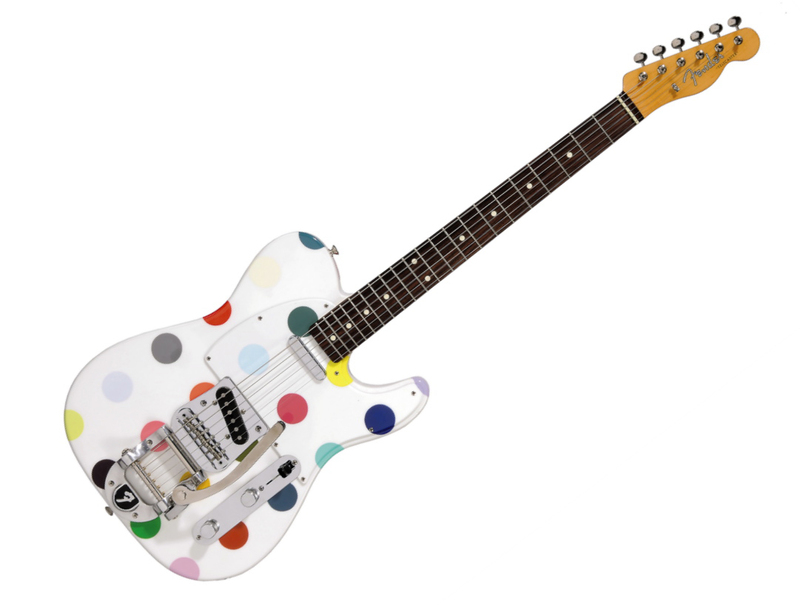 Hirst also used his trademark spin painting technique to create this stunning Carparelli guitar, which was auctioned at Christie’s on Feb. 17th 2011 and garnered a price of £91,250. All proceeds were donated to War Child, an international organization which supports children affected by war. Hirst’s retrospective at the Tate Modern runs from 4th April 2012 until November 9th 2012. Channel4 are running a special preview before the show opens here.